How To Delete Ramnit Trojan Completely? Ramnit is a Trojan that secretly gets inside your PC and leads to plenty of annoying troubles on your system. This Trojan has been developed by a group of cybercriminals having wrong intentions and evil motives. The original RAMNIT variant was a worm which was first encountered in 2010. It propagated through several removable drives and FTP servers. 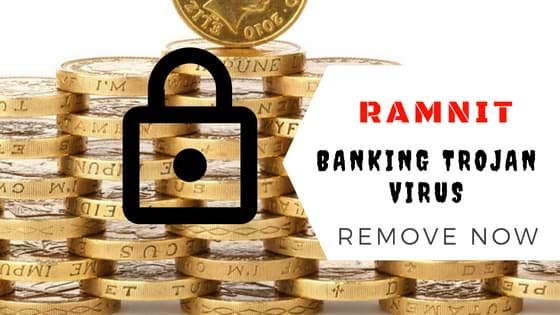 In 2011, it was discovered that Ramnit copied some parts of the Zeus source code to transform itself into a banking Trojan. Being a banking Trojan, it stole user credentials and other personal information. Ramnit has the ability to evolve and spread itself. Its developers have expanded its capabilities over the years by adding features such as web injection mechanisms that allow it to compromise the websites of financial organizations. Related: What is Nanocore? and How to remove nanocore virus? If by any means, you got Ramnit Trojan, the only solution is to remove it immediately for the proper functioning of your system. This will also ensure that your system is free from Trojans and other malware. How Ramnit Enters your System? It can enter the computer through social networking websites which incite the users to click on malicious ads. This method is known as Social Clickjacking. It can get into your PC through nasty malicious URLs, email attachments and social engineering attacks. It can enter your PC through infected removable drives like hard drives, USB flash drives, etc. It can spread to old victims who are unable to clean up previously infected files, making them prone to reinfection. It also spreads via Angler exploit kit found embedded in a compromised website. What are the Harmful Effects of Ramnit? This threat is part of the family of multi-component malware which infects Windows executable files, Microsoft Office files and HTML files. It steals confidential information such as saved FTP credentials and browser cookies. It steals cookies from the compromised PC’s browsers, stores them in archive files and sends them to the C&C server. It tricks you into installing other malicious malware which brings more problems. It hijacks online sessions and social media websites. It displays fake update notifications, security warnings & error messages. It functions as a backdoor allowing remote attackers to access the compromised system. To spread itself, the threat infects EXE, DLL, HTM & HTML files and makes copies of itself on removable and fixed drives. This allows the Trojan to be dropped back onto the file system and executed again if the compromised system’s Antivirus software detects and deletes the Trojan or quarantines it. Your PC becomes unable to detect external devices such as flash drives, CDs/DVDs, hard disk, etc. Follow the given Ramnit Removal Process to get rid of the malicious malware. You can easily remove Ramnit with free malware removal tool. Use a reputed and automated free malware removal tool to delete Ramnit permanently from your system. After successfully eliminating the malicious Trojan, make sure to create a robust firewall to avoid any such issues that makes your system and privacy vulnerable to various online threats. How to Prevent Installation of Trojans and other Malware? Be Extra Vigilant: Be cautious while downloading and installing free programs. Keep your Windows Updated: To avoid such infections, we recommend that you should always keep your system updated through automatic Windows update. According to a survey, outdated/older versions of Windows operating system are an easy target for attackers. Regularly Back up your Data: Regular backups helps you to keep your data safe in case the system is infected with any kind of virus or any other infection. Thus, always back up important files regularly on a cloud drive or an external hard drive. Always Use an Antivirus: We recommend that you install an Antivirus or a good Malware Removal Tool to keep your system protected. Implement Security Practices: Follow best practices for email and social media security. Never click on unknown links or download any attachments in the email, especially if it comes from a suspicious source. Two-Factor Authentication: Use two-factor authentication and manage account passwords on a regular basis. Previous Post:How To Remove Cydoor Spyware From PC?